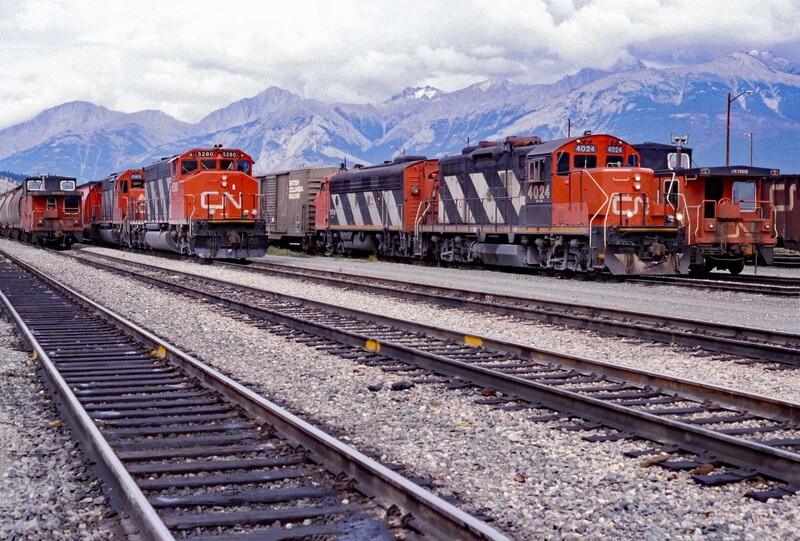 Railpictures.ca - colin arnot Photo: An old time shot of Jasper yard. Taken in 1987 probably August as it would have been a vacation shot. We see GP9u CN 4024 with F7Au CN 9159 and beside them caboose CN 79519. The other grouping is SD40-2(W) CN 5280 SD40 CN 5165 and beside them caboose CN 70074 | Railpictures.ca – Canadian Railway Photography – photographie ferroviaire Canadienne. Great catch!! I’ve never seen a rebuilt geep with an F unit. They look great together.